Sega's Phantasy Star Portable series is now finger-lickin' good. Today at the Tokyo Game Show, Sega revealed that the Col. will be a recruitable character for upcoming title Phantasy Star Portable 2 Infinity. You can go on missions with Colonel Sanders! 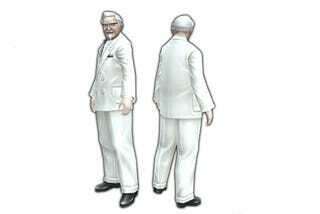 The Colonel will even have his own attacks. Pictured is his in-game render. This year marks the 40th anniversary of Kentucky Fried Chicken in Japan — hence the cross promotion. Phantasy Star Portable is no stranger to food promotions. Phantasy Star Portable 2 featured Pizza Hut. Phantasy Star Portable 2 Infinity will be out this winter in Japan.